Czech republic has offered to provide anti aircraft missiles for SLAF while LTTE's de facto air force continued to pose a threat to Sri Lanka. Czech offer includes supply of state-of-the art AA missiles, training and even personnel to man the launchers if required. Whether the GOSL will accept the offer or not remains to be see. LTTE is known to operate between 5 to 10 Zlin-143 light planes and have so far attempted 7 raids on both military and economic targets in Sri Lanka. A locally made bomb rack has been attached to at least one of these aircrafts. However payload delivery seems to be lever activated and this may be the cause of reduced accuracy. Even though the LTTE planes have had little success in terms of damaging military/economic assets, they have significantly boosted LTTE's morale and have further strengthened Eelam Diaspora funding. This is not the first time Czech government pledged help to the Sri Lanka military. After the fall of Elephant Pass base complex in 2000, LTTE laid siege to Jaffna trapping 32000 government troops in the Peninsula. By that time LTTE had managed to acquire weapons with higher firepower such as the 152mm artillery. 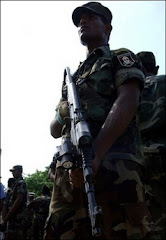 This is when the Sri Lankan government turned to India for offensive weapons but all India had to offer were transport aircraft to evacuate 32000 forces from Jaffna. However Pakistan and Czech republic came to Sri Lanka's aid by providing Multiple Rocket Launchers (BM-21 and RM-70). One shipment of RM-70 MBRLs went missing for several days when the plane carrying the hardware landed on a different country. Plane was later found and finally the delivery was made to Sri Lanka after a significant delay, only to be found that MBRLs that were on board were sabotaged. Luckily for the army, the machines were repairable (Later MI discovered that the Norwegian intelligence agencies were behind the whole fiasco). When the first MBRL barrage was fired on Pooneryn, LTTE artillery that were pounding Palaly for days immediately fell silent. RM-70 and BM-21 MBRLs were used extensively to push back the LTTE forces that laid siege to Jaffna and the machines were responsible for halting LTTE's unceasing waves III operation. In addition to the MBRLs, Czech government recently offered to provide Unmanned Aerial Vehicles (UAV) for SLAF to replenish its inventory from losses suffered in AAB attack. In the meantime Sri Lanka Air Force (SLAF) flew three sorties on LTTE military installations in the North during last week. Surprisingly, both government and pro LTTE media were silent about the attacks. As usual, casualty figures from these aerial raids are not available as of now.